As our school grows, the classes offered will reflect the skill level that is developing. The kids are fast gaining experience and improving their strength. We are beginning the process of levels in classes this term. If you are interested for your child to do a class but are sure of which one, please feel free to give us a call or send us a message. We are more than happy to guide you to the right class so your child gets the most out of Cirque M! Cirque M Kids (CMK)- Multi circus and aerial skills class for 5-8 year olds. CMK AERIALS LEVEL 1A- Aerial skills focus class with games and warm ups and aerials! for 8-11 years. This class has an aerials focus. We still have all the fun warm up games of the younger years class (lets be honest we all love to play) but the focus turns to gaining a greater understanding of aerials and solidifying aerial skill bases. The kids will start to progress through the level 1 curriculum in a variety of aerial equipment throughout the term. Ideal for beginners and for kids building on their strength for aerials. CMK AERIALS LEVEL 1B- Aerial skills focus class with games and warm ups and aerials! for 9+ years. CMK YOUNG TEEN AERIALS LEVEL 1A- Aerial skills focus class with games and warm ups and aerials for 11-15 years. This class has an aerials focus class. We have all the fun warm up games of the younger years class (lets be honest we all love to play) but the focus turns to gaining a greater understanding of aerials and solidifying aerial skill bases. The tweens will start to progress through the level 1 curriculum in a variety of aerial equipment throughout the term. Ideal for beginners and students that train other disciplines such as dance or sports. Aerial level 2 is a specific aerial class for kids who have done at least 2 terms of Aerial level 1. The teachers will asses if the kids individually and will let you know when we think a student is ready to move into this class. It is not based solely on skills acquired but attitude and aerial awareness and 'readiness'. This is a more focussed group so the fun is still present, focus goes towards developing more technique, repertoire and confidence in the air. Kids in level 2 aerials and above are invited to train at our new CMK open training session. 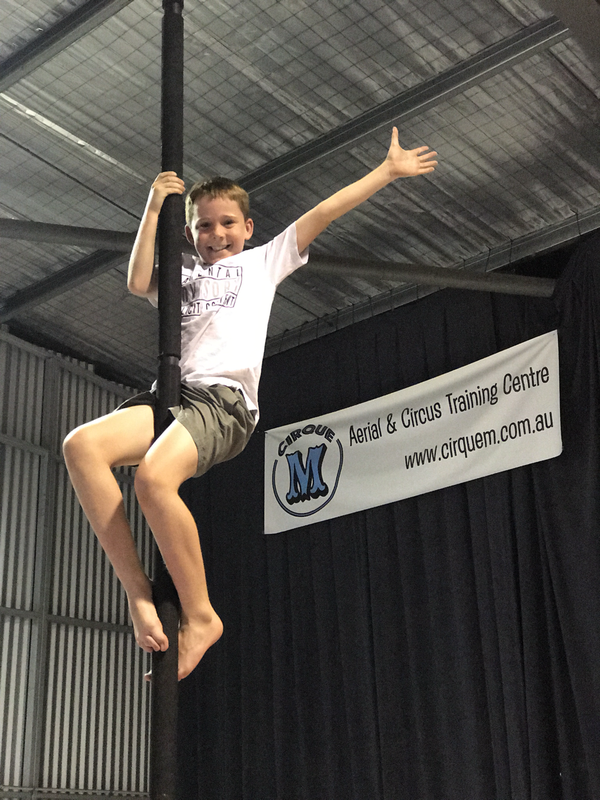 This is a $5 training supervised session where the kids can practice and be creative with aerials to 'practice' what they are learning in their own time. see below. This class is for kids who are advancing in the level 2 aerial class. It has a smaller number of places and is designed to increase the skill level intensity and create well rounded aerial superstars! Your childs place must be cleared byt their instructor PRIOR to booking. There is a maximum of 8 students in this class only. This class is designed to really hone the kids performance skills and allow them to explore what it takes to create performance works with this spectacular medium. We aim to perform throughout the year and offer the kids as much experience and exposure to the greater circus world. This class is by invite only and is quite a commitment. Students are required to paritcipate in at least 2 classes per week and attend practice training when possible.